Going back to when we entered, we were welcomed into the country with a lot of friendliness, waves, beeps and hellos. Even waiting to cross the border we had been chatting to a few Kazak people who studied in China and were on their way home. They were really interested in what we were doing and were chatting with me, rather than directing questions at Andy, which is what I had found with a lot of men throughout China. It was a good first impression. We were feeling optimistic about our time here, and on the whole we enjoyed it. 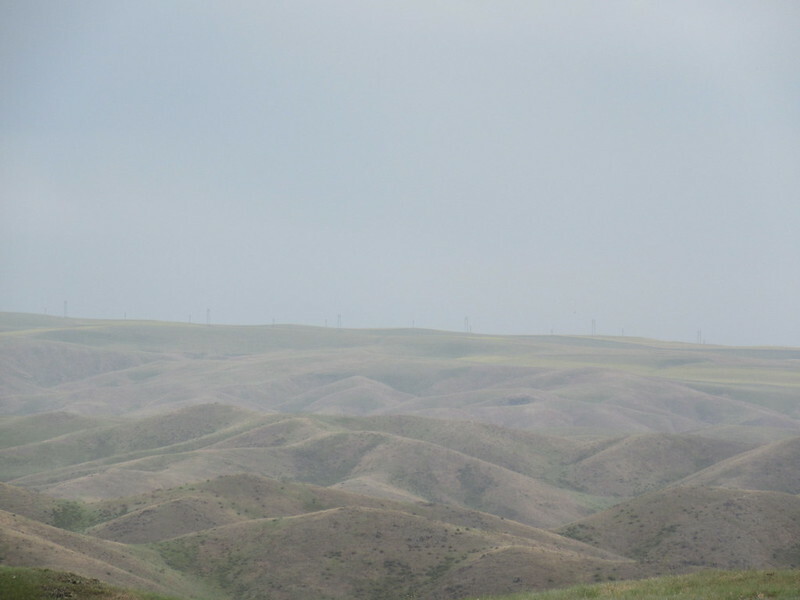 As we got closer to Almaty people seemed less friendly and as we headed towards Kyrgyzstan they were more friendly again. People were keen to hear what we thought of their country and they were extremely proud of it, which was nice to see. It was strange for us to see such a mix of different looking people, especially after living in Japan for 5 years and travelling through East Asia. We’re from the UK so it shouldn’t seem strange but it did. So many people with different coloured hair, and eyes, and skin. There is a real mix of Kazakh, Russian, Uzbek, Ukranian, Uyghur etc. and for once we were ‘normal’, blending in with other people. I guess I do more anyway with dark hair and eyes but Andy with light hair and blue eyes not as much. It was quite refreshing. Another thing we had been aware of moving from Eastern Asia to Central was a change in religion. With around 70% of the country’s population Muslim. Being in any country in the world you want to try and be respectful of their culture and religion, so we always err on the side of caution when we enter until we understand a bit more or can mimic what others are doing. For example, I like wearing a vest top cycling when it is super hot. I was therefore surprised to see that many women in Kazakhstan showed their arms and shoulders, allowing me to feel comfortable to do the same. I feel as we travel further along our route this will change. Kazakhstan is the most developed country out of all the ‘stans and therefore maybe has more liberal views. It is currently Ramadan at the moment and you wouldn’t know it. The food in Central Asia was not bigged up to us (thanks Sarah & Scott) so we gorged ourselves in Khorgas before crossing over. We really didn’t need to, or at least not yet as we have had a lot of time in cities eating plenty of food and over indulging. We have actually really enjoyed what we have been eating so far. There are a few staple dishes that we know will be on most menus. One being Lagman, where the noodles are stretched by hand. 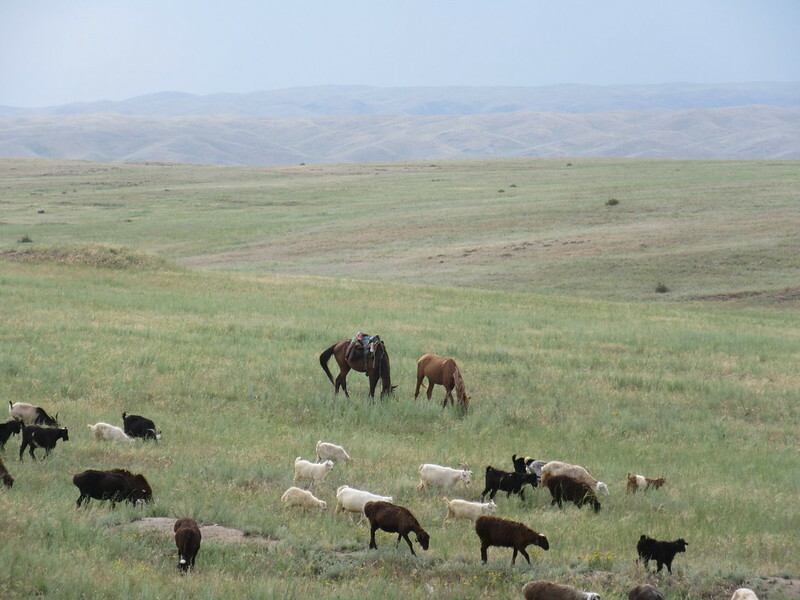 Originating in Western China but taken to Central Asia from people travelling along the Silk Road. The noodles are in a broth with vegetables and meat. Minus the noodles it is just like my favourite stew my gran used to make for me, accompanied by bread to dip in the broth, delicious. We’ve also enjoyed Samsa, that reminds us of a cornish pasty, sold in a lot of the small local shops. A great snack to pick up for cyclists. One other dish we really like is Shashlik, grilled meat cooked on coals. 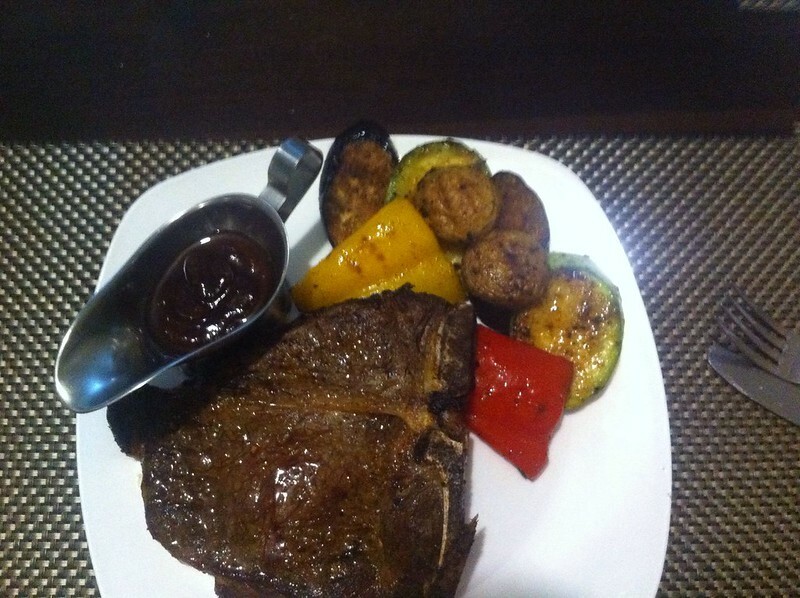 A great choice of meats and extremely tasty with beer. 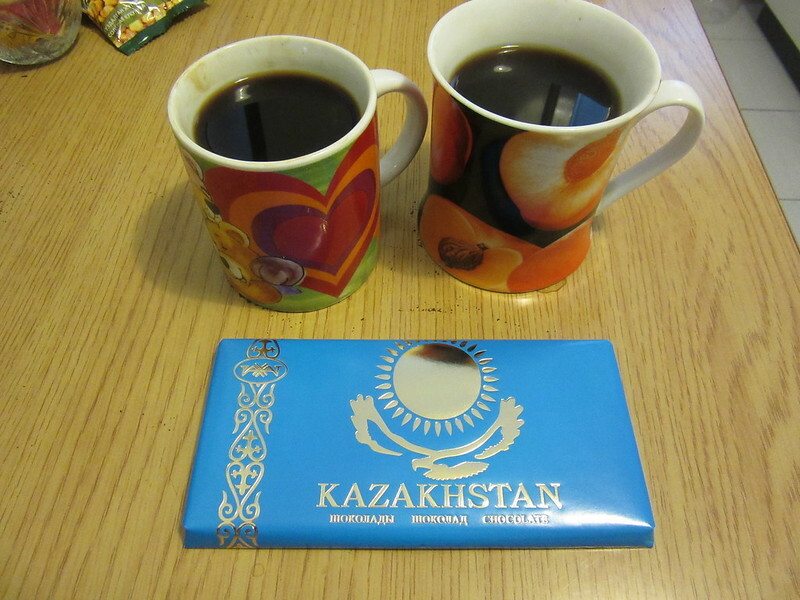 A little bonus treat we have found is Kazakhstan chocolate, only around 50p for a big bar, so good with coffee, a lovely way to round off a meal. 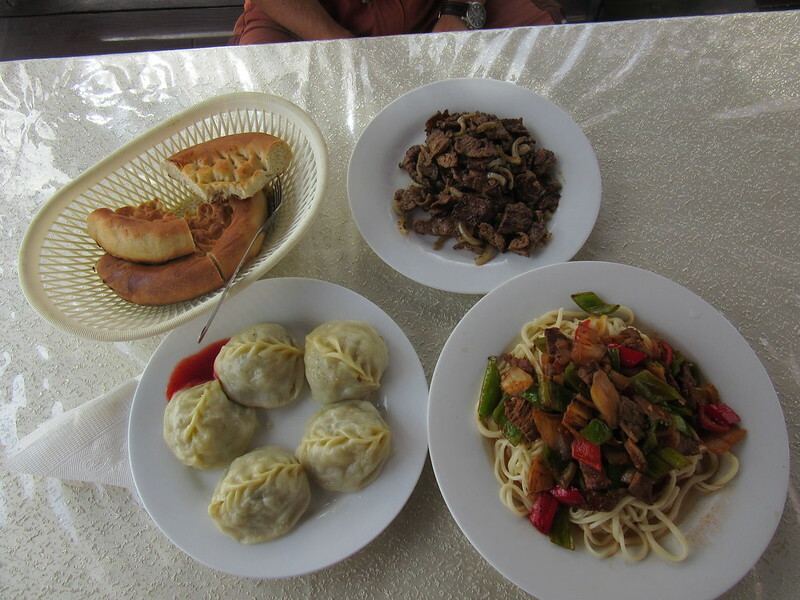 Plus being in Almaty, which used to be Kazakhstan’s capital city and is the most populated city, it offers an abundance of restaurants from all around the world. As we were there for 5 nights we made the most of our time. So far so good on the food front. Maybe see how we are in 3 months when we’ve been eating Lagman every day, then we’ll probably be in agreement with a lot of other people who have said the food isn’t great in Central Asia. 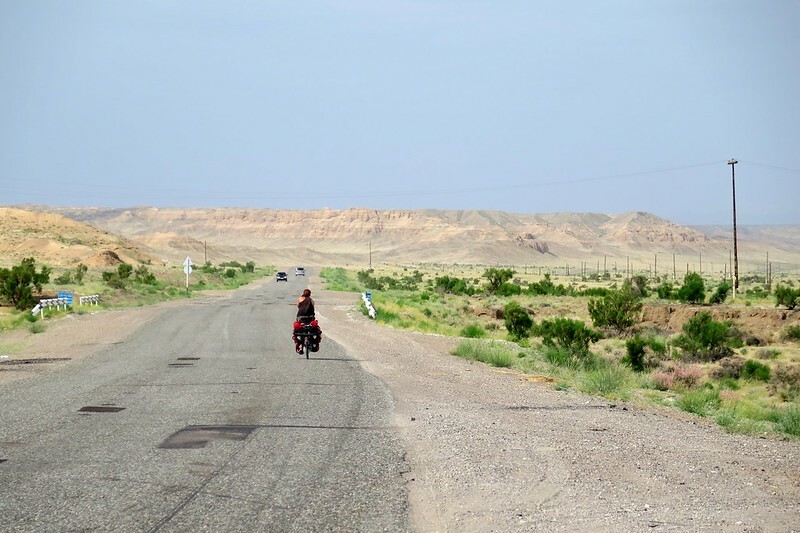 Something else we knew would be changing as we entered Central Asia was the state of the roads. 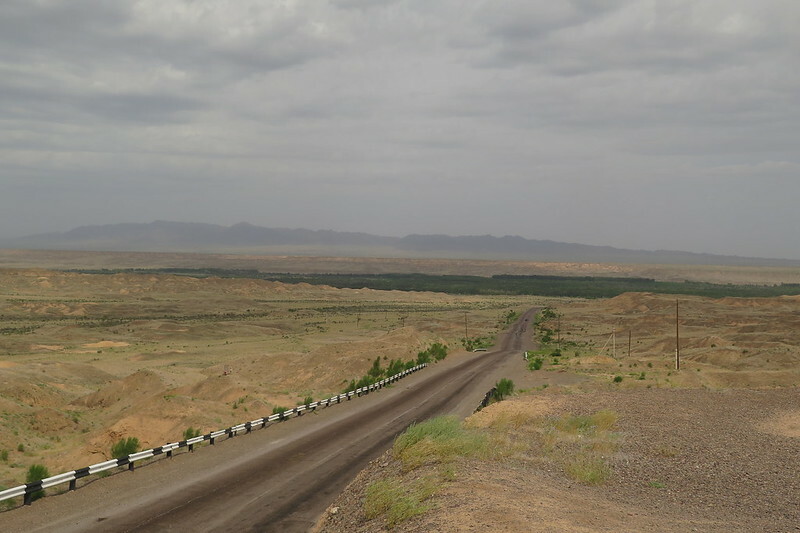 We had been told Kazakhstan wouldn’t be too bad but pretty much as soon as we entered, the road was much more narrow and there were plenty of pot holes. It did mean a lot more looking down at this than at the view. There were stretches that were far better than others and there were massive sections on the way to Almaty that were being resurfaced. 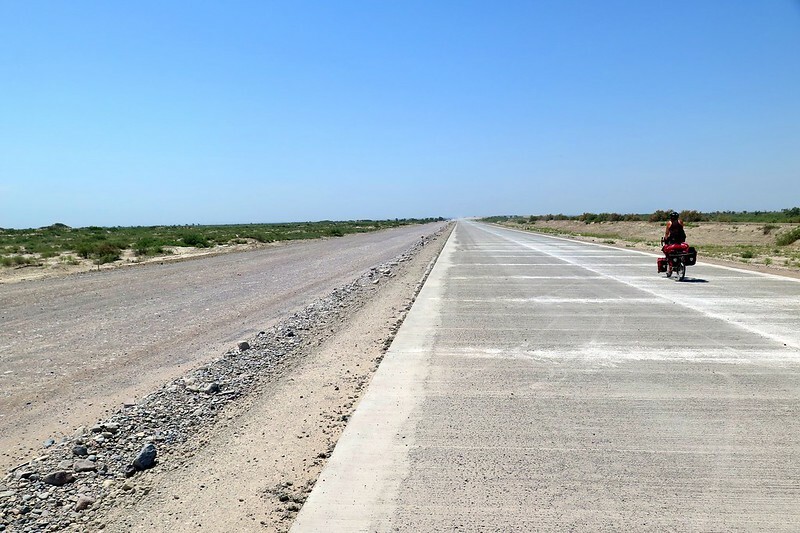 I know in comparison to what is coming up this was extremely smooth and a pretty good road surface that I’ll be wishing I were on when we’re elsewhere, but we have just come from Chinese roads. What did unsettle me was the speed the cars were travelling at. They moved a lot quicker than China and with smaller roads and pot holes it was more of a concern. Over all the vehicles were pretty good and gave us plenty of room. 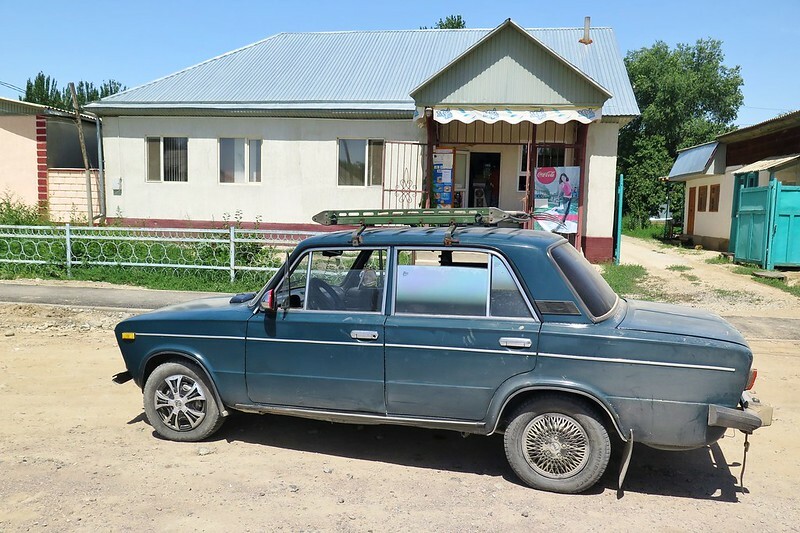 There were so many old cars on the roads, Andy’s favourite being a Lada 4×4 (sadly I don’t have a picture). A large number of vehicles having to pull over for some sort of maintenance. There were also a lot of garages in the towns we went through, I’m sure always busy with customers. We hardly saw any motorbikes or mopeds. Trucks, cars, horses and donkeys seem to be the main transportation methods, and a few buses. As I said before some areas we went through with nothing around had the longest roads, stretching off into the distance, which tested us a little as the scenery could get a bit boring as it seemed never ending. 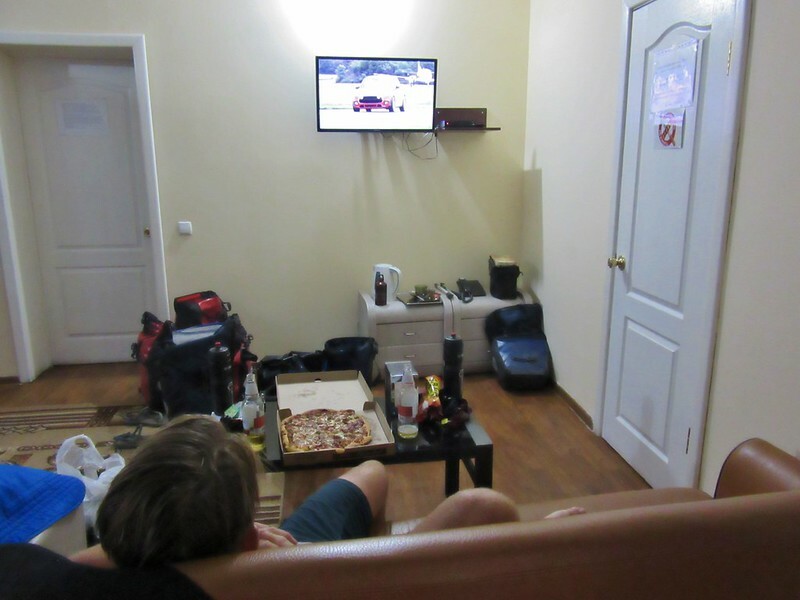 After we left Almaty we only had a few more days until we were crossing the border into Kyrgyzstan and I felt we were only just starting to get into the swing of things. 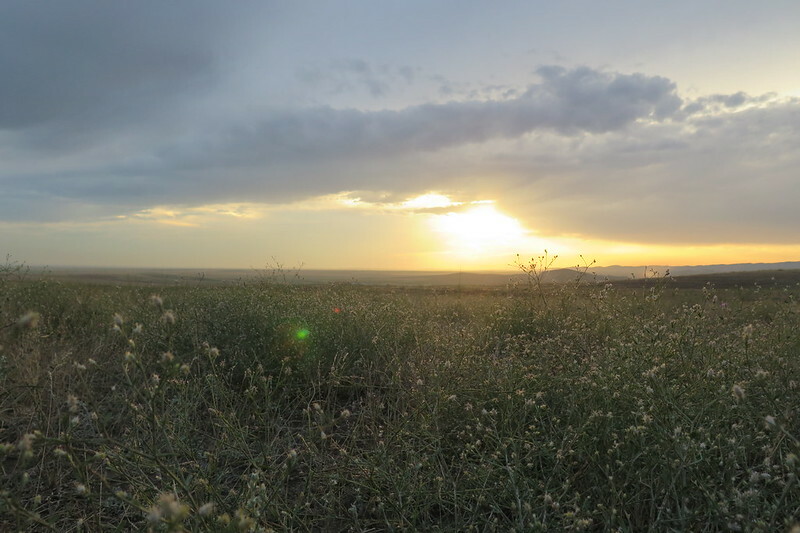 With Kazakhstan having such a low population density it meant camping was pretty easy and the only people we would see were shepherds who came over to say hello, ask where we were from and leave us to it. No issues with us being there, which was useful when we had two nights of rain and wanted to stay in our tent until it had eased off. 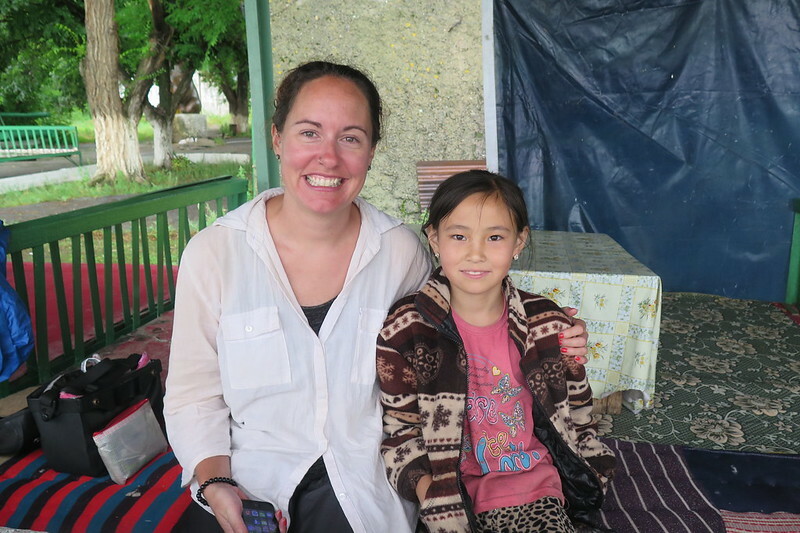 We hadn’t thought much about our time in Kazakhstan before we got there. Overall we did enjoy it. We had a couple of tough days with the weather but other things compensated for that. 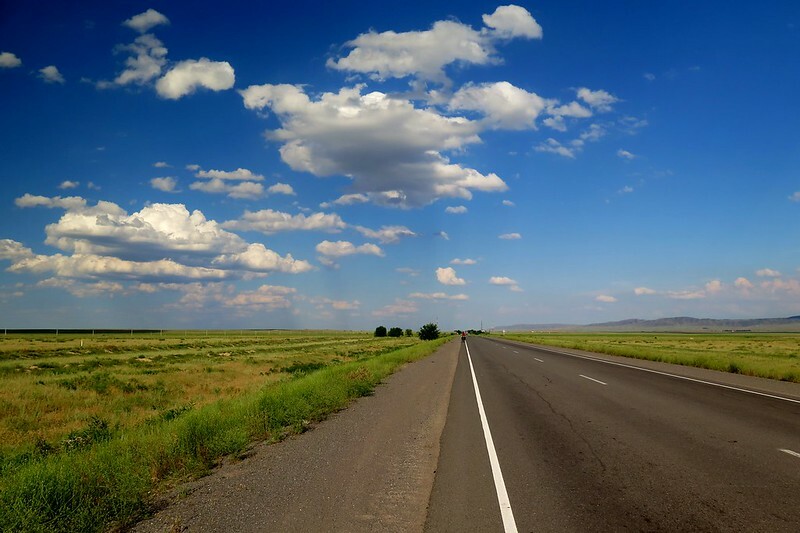 I’m glad we went but I don’t think we would want to travel the whole length of the country, especially as the west of the country is even less populated with longer stretches of nothing between towns. 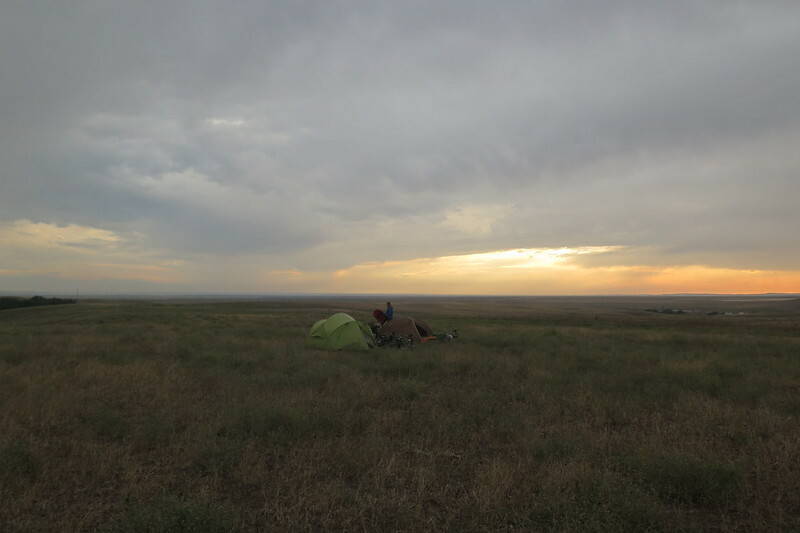 I hope that doesn’t all sound too pessimistic because we did like Kazakhstan and were glad to have cycled some of it. The highlight was after climbing over a relatively small pass, we had around 15km of gorgeous scenery with some fun downhill, rounded off by some delicious shashlik and a stunning camp site for our last night before crossing the border. Our lowlight was when we had our hardest headwind to date. Amazing how mother nature can change the experience of a place, we never underestimate her! Great descriptive blog Clare. Really love reading these blogs. Thank you Tess. Hope your training is continuing to go well. Probably won’t have too much trouble with the dress code in the ‘Stans, though I can only really speak to Uzbekistan as well as Kazakh. They’re very moderate Muslims (probably because of keeping their heads down under the Soviets). 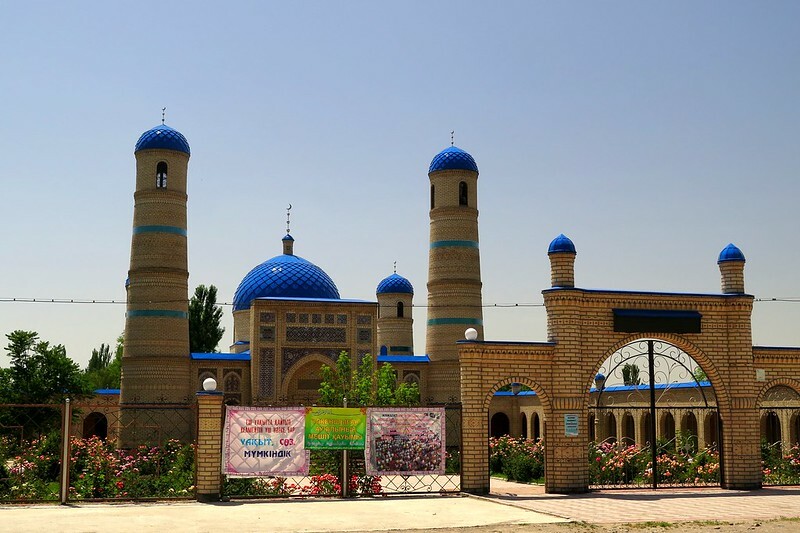 Certainly, Uzbekistan is similar. Now you mention it, yeah, not many beards at all! No problem for me there, never been able to grow anything more than bumfluff! Definitely enjoying the easy access to booze and chocolate!